I would like to thank "The History of English Podcast" for recommending "Fun With Frisian" at the end of Episode 28: Angles, Saxons, Jutes & Frisians. The kind mention certainly made this blogger's day! Tanke wol! Today, we'll look at the word gauris, which can mean " a lot," "often," "frequently," "much," or "commonly." It is pronounced with the "ow" diphthong in "gown" and takes a schwa in the second syllable. GAURuhs. In tongbrekkerssechje is in wurd, of in sin, dêr't de útspraak gauris problemen fan jaan kin. A tongue-twister is a word or a phrase that can frequently cause problems with pronunciation. You can follow the link to the article to see some Frisian tongue-twisters. Tongbrekkerssechje breaks down into three parts. Tong is from the word for "tongue," tonge, and is pronounced with a long "oh" as in "tone. TOHNG. Brekke means "to break." The first vowel is an "eh" as is "wreck," and the second syllable takes a schwa. BREHK-kuh. Finally, sechje means "saying" or "proverb." As closely as I can figure out from examining similarly spelled words, it would be pronounced with an "eh" followed by a -k- and it ends with a schwa. Remember that a Frisian j is pronounced like an English -y-. SEHK-yuh. Wurd means "word" in this context. It is said with the purse-lipped "o" with an umlaut over it that is found in German, and the initial consonant is a v-. The -r- sound may sometimes get dropped. VÖRD. Of is the word for "or." Say it with the shorter "o" heard in"dot" or "pot" so that it sounds rather like the English word "off." The word útspraak means "pronunciation." Say it with an "ee" sound on the first syllable and a long "ah" as in father. EET-sprahk. Sin has a few meanings, including "phrase." Say it just like the English word "sin," which is actually not one of its modern meanings. 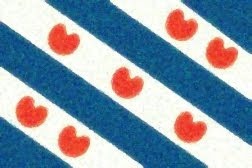 The Frisian word can also mean "longing" or "desire" and is comparable to its German cognate, Sinn. Jaan means "to give." It is pronounced with a particularly long "ah" as "yawn" or "father." YAHN. Note that it is under jaen (old spelling) in P. Simpa's glossary. Fan has various meanings, including "of" or "by." Say it like the English word "fawn." Kin means "can," "may," or "is able to." It is said with a short "ih" just like the English word is looks like, "kin." Hello. I've enjoyed reading this blog. I love to see Frisian language resources popping up on the net. Can you perhaps help me with a grammar/spelling question? What is the difference between Frysk and Fryske? Each time I ask someone I've gotten a different answer and I can't seem to find a good text. Thank you very much for reading and for commenting. The difference seems to be one of grammar: in real-world examples, we see "Frysk Museum" (Frisian Museum), "Fryske Akademy" (Frisian Academy), and "De Fryske Wâlden" (the Frisian Forests). I was hoping that the explanation would be a simple breakdown between whether an adjective precedes a masculine or feminine noun, but apparently things are more complex. According to P. Sipma's book on page 61, The Adjective, the finalizing -e hinges on quite a number of factors, including the gender of the noun the adjective precedes *and* whether or not there is a definite article or other preceding words. His text is the first link under this blog's "Resources" if you want to delve into the subject in (painful) detail. Again, thank you for commenting, and hope that this was of some help!